Part mystery, part coming of age story, The Van Apfel Girls are Gone is set in a distant suburb on the encroaching bushland, over the long hot summer of 1992. It’s the summer of the school’s Showstopper concert. The summer Tikka never forgot. The summer the Van Apfel sisters disappeared. Blackly comic, sharply observed and wonderfully endearing. Tikka Molloy was eleven and one-sixth years old during the long hot summer of 1992 - the summer the Van Apfel sisters disappeared. Hannah, beautiful Cordelia and Ruth vanished during the night of the school’s Showstopper concert at the amphitheatre by the river, surrounded by encroaching bushland. 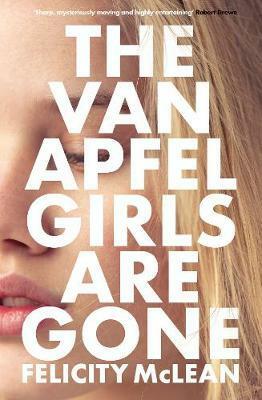 Felicity McLean creates a wonderful eleven-year-old narrator, Tikka, in her debut novel, The Van Apfel Girls Are Gone. It is through Tikka’s eyes the reader sees the events of the long, hot summer of 1992. The Van Apfel girls of the title are Tikka and her sister Laura’s friends and neighbours. Hannah is thirteen, Cordelia twelve, and Ruth is only seven. The girls live in a regional New South Wales town where neighbours are friends by necessity, and everyone thinks they know each other’s business. Tikka is a character many would call ‘precocious’: she’s smart; she watches and listens for changes in the adults and adolescents around her, and she desperately wants to be a part of her older sister’s friendships. Tikka worships the ethereal Cordelia, and when the novel begins, we are introduced to adult Tikka – twenty years on – jumping out of a taxi in Baltimore to pursue a stranger she thinks is Cordelia. This is how we know the Van Apfel girls are still gone, and thus begins the recounting of events leading to their disappearance. McLean cleverly utilises Tikka as a slightly unreliable narrator – being only eleven she observes and overhears odd things that make more sense to the reader than they do to her, and add to the tension in the story. Tikka is often told off by her parents or teachers for blurting things out or telling truths no one wants to hear. While the disappearance is at the heart of this novel, it is not a thriller or work of crime fiction. It is page-turning literary fiction, in the same vein as Jasper Jones by Craig Silvey, or more recently, Holly Throsby’s work. It’s also a coming of age story, and a demonstration of how events occurring in childhood can have a lasting effect on the psyche. This novel would be a great choice for book group discussion. Annie Condon works as a bookseller at Readings Hawthorn.